Regardless of the asking price, no guitar will sound right unless it’s in tune. Tuning the strings to the desired pitch allows the guitarist to play in harmony with other instruments (any, including voice) or to at least harmonize with itself. Whether on the gig or just jamming, the added convenience of electric tuners help the player ensure his instrument is in tune, giving him the ability to make tuning adjustments on the fly if necessary. Plug one end of the cable into the input jack on your guitar and the other end into the input jack on the tuner, then turn the tuner on. If you're not plugging in a tuner, lay the tuner on a flat surface and position the guitar’s strings as close to the tuner’s mic as possible before turning the unit on. Pluck the top heaviest string on the guitar (E) without fretting any notes on the fingerboard (called “open” notes). Look at the readout on the tuner: for metered tuners, the needle will fall directly on the E if the string is in tune and to the left or right of the E if the note is sharp or flat (digital tuners will read sharp or flat either with a LCD readout or LED lights). Turn the tuning key of the E string peg on the headstock away from you to tighten the string, which ups the pitch, or turn it toward you, loosening the string which lowers the pitch. Watch the readout as you make small incremental turns to the key. When correct pitch registers, the correct note will read on the indicator. Tune the remaining strings (A,D,G,B,E) in the same manner. If tuning down a half or whole step (E flat or D, respectively), loosen the E string until either E flat (about a quarter turn of the key) or D (about a whole turn) registers on the indicator. 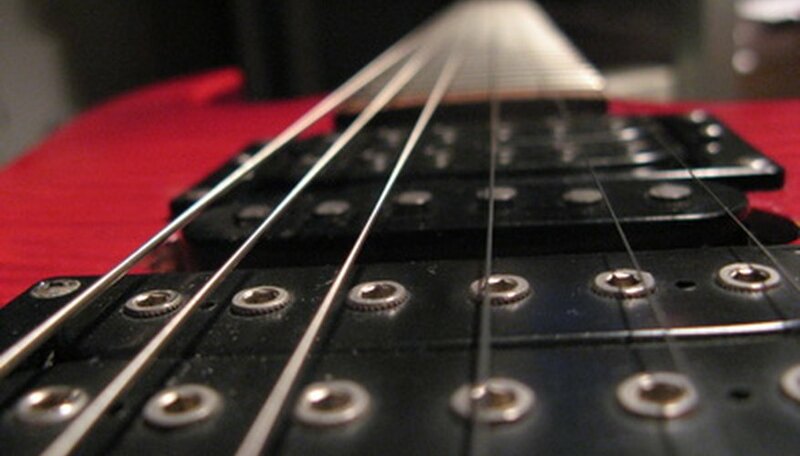 Avoid overturning the tuning keys if tightening, which may result in string breakage.